This books was one of the strangest reading experiences I’ve had in a while. The story concerns a group of Japanese tourists, visiting Buddhist holy sites on a tour of India. It’s a bit like one of those 1970’s movies that featured a disparate cast of characters thrown together and then forced to confront each other through facing a common hardship. Their tour is not a very good one. One couple is on their honeymoon–she’s unhappy that she didn’t get to go to Europe while he wants only to take pictures of the strange sights he sees. One man is looking for the reincarnation of his wife who died from cancer years before. He has heard of a child who claims to be a reincarnated Japanese woman. Another is a World War II veteran hoping to have prayers said for his fallen comrades who did not make it home from their time in South Asia. Yet another is a woman traveling in search of a college acquaintance, a failed priest rumored to be working among the impoverished Hindu pilgrims on the banks of the Ganges river. The author is Japanese, the concerns of the characters are both universal and specific to Japanese culture. I come to the story as an outsider, just as the book’s characters come to India as outsiders, putting me at a doubly removed distance from the events described. That religion and spirituality play such important roles in the book also served to distance me from the book as I have little to do with either. The characters end up spending a great deal of time on the banks of the Ganges River where Hindu pilgrims go to die or to spread the ashes of their departed family members. Some very devote people drink the water of the Ganges as they bathe in it. The customs around these rituals are difficult for a Westerner to understand, again putting me at further distance from the narrative. But in spite of the distance between my own experience and that of the characters, I came to care for all of them and to understand if not partake in their spiritual journey. Mr. Endo works some magic here, because by rights I should never have made it all the way through this book. At one point, during a discussion about the nature of God, I even began to suspect that I had picked up a piece of Christian fiction by accident somehow, though by the end of the novel it’s clear that Mr. Endo’s message is greater than any one religious point of view can contain. I still don’t know quite what to make of the experience I had reading Deep River. 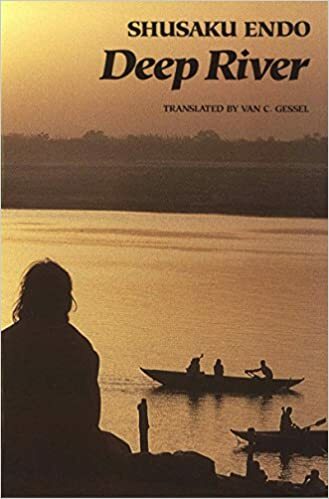 How is it that Mr. Endo has made me consider the intermingling of life and death experienced by those who bathe in the Ganges among the ashes of the dead as something wonderful? Something I might consider doing? I recommend Deep River and look forward to reading more by Shusaku Endo. Since stumbling upon Shusako Endo and running this review several years ago on my old blog Ready When You Are, C.B., I’ve become something of an Endo fanboy. I’ve read two more, Silence and The Samuria and can recommend them all Mr. Endo is now one of my all-time favorite writers. Previous Previous post: Seen the the San Francisco Airport history of the typewriter exhibit…a typewriter once owned by Tennessee Williams.